“I'm stuck, I have reached a plateau and I can't make any more progress.”? I hear these and similar questions and statements all the time. Therefore I have compiled a list of more and less obvious tips & actions – in no particular order – that will push your dancing forward. Some of these points are related to one or more others. Additionally, I recently asked the question on Facebook and Twitter: “What tip would you give to your friend, if he/she asks you, how to become a better dancer?“. You'll find a summary of the answers as a bonus later in this post. But first, let's start with the list. At least once a week, the more the merrier. It doesn't matter if you do it alone or with a partner. Ask yourself, what do you like about other dancer's dancing: rhythm? moves? musicality? simplicity? complexity? Extend your repertoire of steps and movements. There are plenty of them published by international swing dance instructors. Find out, what are the similarities and differences between the concepts of different instructors. What kind of music makes you dancing, what not? The 32-bar AABA structure is the most used form in jazz/swing music. This is related to musicality. Get individual feedback and inspiration. Probably the best way to quickly improve your dancing. It might be easier for some of you to compete in a group instead on your own. You can do that on your own (alone, with a dance partner or in a team/group) or you can take classes. Get inspired. Steal moves, even if it's not a swing dance movie. Jack & Jill competitions are for fun, so don't take it too seriously. Competitions can push you forward to learn new moves or variations. It can be very inspiring (I know, though, not everybody likes to compete). Do you like to perform? Then join or even establish a performance group. That's especially interesting, when your buddies are more or less on the same dance level. You can teach each other new moves or you can give direct feedback to each other. Do it as often as possible. Get the feeling for the music. The Song of the Week is a great starting point to find danceable songs. Instead of just taking classes. It's more intense, sometimes even overwhelming, but it brings you to new heights much faster. This is related to Jazz and swing. Learn the difference of the styles. What feelings do you get while listening? Beside the AABA form, this is the most used form in swing music. Also related to musicality. The focus is usually more on the social aspect of dancing. Often without classes, but with lots of social activities. Meet new people, get inspired. Camps that last a week or even longer are quite different to workshop weekends. 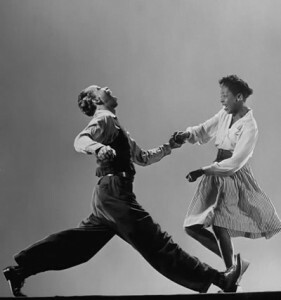 You can dive into the swing dance world and forget about everything else. You even start to dream swing :)! A perfect environment for grand strides. Learn the difference between micro and macro musicality. If you like biographies, then you should read at least these two (see: book tips). Also interesting: biographies about jazz musicians. 1. You learn the differences and similarities. 2. Your body learns new ways of moving. 3. You get new moves and variations you can include in your swing dancing. While teaching, you get a different point of view to the dance. Style is king and encourages self-esteem. Similar to Jack & Jill competitions. In Strictly competitions, the focus is on partnership: lead and follow, harmony etc. So, you usually sign up with your regular dance partner. This is another great way to improve your dancing, especially when you like competitions. Learn to follow as a leader and learn to lead as a follower. It not only helps you to improve your dancing, you also start to appreciate more your partner's skills! The same like teaching a taster class, while teaching regular classes goes much further. You have to be able to break down steps, moves and variations, to make it understandable and easy to learn from you. It's obvious, that your dancing will improve automatically. To play an instrument gives you another angle to the music. By the way, Herrang Dance Camp is offering a swing orchestra class in week 5 – for the third time in 2012! Why not spinning yourself from time to time? You learn a lot about music while discovering danceable tunes. If you are interested in swing DJ'ing, then you can sign up for my Swing DJ Resources emails. That doesn't directly improve your dancing, but your alliance with the dance gets closer for sure. As I wrote earlier in this post, I asked my Facebook friends and Twitter followers for their tips. Here is a summary and some interesting statements. What tip would you give? Now it's your turn! Let me know in the comment section below, what else could be done to become a better swing dancer! ?